When it comes to metal buildings, Kentucky residents know to look to Alan’s Factory Outlet for the best deals. 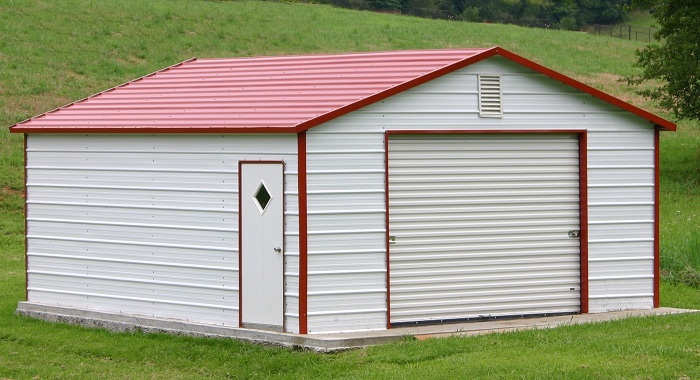 We’re proud to offer many different sizes of portable metal storage buildings for sale, and these Kentucky steel buildings offer durability and add usable space to any property. Better still, our high-quality Kentucky metal garages are delivered and set up for free anywhere in the state, including Louisville, Lexington, Bowling Green, Owensboro, Covington, and Frankfort. When you order metal garages in Kentucky, you can choose from a wide range of custom sizes and styles, including one-car, two-car, and three-car garages. You get to pick the roof color, side colors, and trim color on your fully enclosed structure, choosing from 16 different colors available for our Kentucky metal buildings. After placing an order with us for one of our metal buildings, Kentucky property owners will get a high-quality product as well as top-notch service. As part of our commitment to customer care, all Alan’s Factory Outlet metal buildings in Kentucky are built on-site, and setup is completed the same day that the installation crew arrives with your delivery. We strive to make ordering metal garages in Kentucky a hassle-free experience from start to finish! When you order metal garages in KY, they’ll be anchored to the ground for free with rebar or to your concrete pad with anchor bolts. Mobile home anchors are also available. 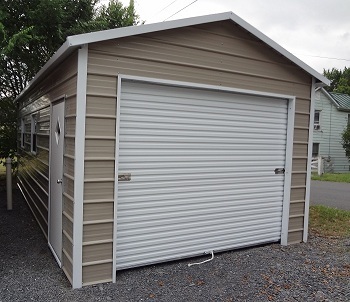 Kentucky steel buildings come with center braces, but you can also opt to have your garage fully braced, with braces placed on both sides for extra stability. 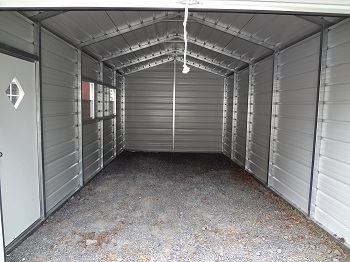 And each of our steel garages in Kentucky is built with 14-gauge tubing and 29-gauge sheeting. Optional thicker 12-gauge tubing is available, which has a 20-year rust-through warranty. Need even more strength from your structure? Certified Kentucky metal garages are another option. When you order certified garages, blueprint drawings are faxed to your local building inspector for your convenience. Each certified metal garage is rated for 130 mph wind and 30 psf snow load, so it’ll be ready to take whatever nature can dish out. Each of our certified steel buildings in Kentucky comes fully braced and with additional tubing on the front and back ends of the structure. Our certified KY steel buildings also include mobile home anchors or additional concrete anchor bolts to give it the 130 mph wind rating. If you don’t need a fully enclosed metal garage, we also offer metal carports. Kentucky residents can enjoy free delivery and setup on these, too. Later, if you decide you want more coverage, you can partially enclose your carport by either closing up the sides or the sides and back. At Alan’s Factory Outlet, we have a wide array of metal buildings, so KY residents are sure to find one that suits their needs, whether they need a small carport or a large RV garage! For top-quality steel buildings, Kentucky homeowners look to Alan’s Factory Outlet, and it’s no secret why: We’re the best in KY. Steel buildings, metal garages, and great customer service are our specialties! Place your order for metal buildings in KY today and see for yourself.